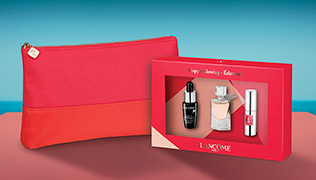 The Star eye-look by Lancôme. Create show-stopping eyes with our mascara and dual-sided brush leaves lashes looking volumised and curled. A “Black Diamond” shade dresses lashes in a deep and glamorous intensity. This chic look is glamorous and unforgettable. This sultry smoky eye is achieved with 5 different shades from your palette. Start by sweeping shade 1 across the lid. By applying shade 2 under the brow bone, you'll highlight and gently lift the brow. Use the darkest shade to outline the outer lashes. Sculpt and take the intensity up a level using shade 4, blending it across from the outer socket line. A touch of shade 5 in the inner corners adds light, and kohl pencil and mascara complete this sophisticated, elegant look.